It’s the DRA’s Fourth Anniversary! Help Us Celebrate and Move Forward. As a busy summer nears its end and we transition into fall, we would like to take a moment to reflect and to share our immense gratitude for your support and what it has helped us accomplish. August has truly been a month for the books. In addition to our ongoing science work, we also celebrated a huge victory in our lawsuit against Portland General Electric. Last week, the U.S. Court of Appeals for the Ninth Circuit sided with DRA and refused to hear a PGE appeal that would have delayed this important lawsuit from moving forward. This decision also left in place a crucial ruling we secured this spring, affirming the rights of citizens to enforce water quality requirements at hydroelectric projects. 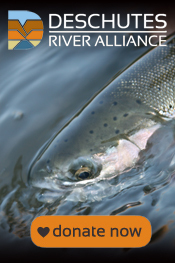 We are proud to say that this month also marks the four year anniversary of the official establishment of the Deschutes River Alliance as a 501(c)(3) nonprofit organization. Over the past four years, the DRA has worked tirelessly to restore cooler, cleaner water in the lower Deschutes River. Besides our important victories in the courtroom, the DRA Science Team has been diligently documenting the sources and extent of the ecological changes occurring in the lower river. A thermal imaging study of the lower Deschutes River and the area around the three dams of the Pelton-Round Butte Complex. This allowed us and others to have a better understanding of the temperature behavior of the river between the PRB Complex and the Columbia River. Two years (and counting) of algae and water quality studies on Lake Billy Chinook and the lower Deschutes River. This work documents the changes in water quality that have occurred since selective water withdrawal operations began, including the water quality violations that are at the core of our lawsuit against PGE. Three years (and counting) of our annual adult aquatic insect hatch survey. This survey was designed by DRA Board member and renowned aquatic entomologist Rick Hafele, to gather data on hatch timing and densities. Over one year of benthic aquatic insect sampling in two locations in the lower river, to document trends in subsurface aquatic insect activity. This study, along with the hatch survey results, indicates an increase in worms and snails along the river’s bottom, and a decrease in adult aquatic insect populations in the air. Funded a GIS mapping project of water quality in the lower Crooked River, to better understand the source of the pollution load entering Lake Billy Chinook. This and more have been achieved over the last four years. None of this could have been achieved without the dedication of people like you. You are what keep us on the water and in the courtroom fighting to restore the river we all love. Our mission continues to drum in our ears. It beats stronger with each day. As the river grows quieter, our voices grow louder. Take a moment to listen to board member and key science team leader, Rick Hafele, as he masterfully recounts the abundance of activity that once filled the Deschutes River. This is where we stand. As we enter our fifth year, we are proud to take with us many victories, but the final battle has not yet been won. After our critical legal victory this month, we are entering a new stage of our Clean Water Act lawsuit against Portland General Electric. Now more than ever, we need your help in our fight to protect and restore this spectacular river. Many of you have a long history on the Deschutes. All of you have at least one story to tell of time spent by or in its waters. If you have been to the Deschutes this summer, you are likely walking away with a different tone to the story of your day. Maybe instead of catching steelhead, you hooked bass or walleye. Maybe you noticed the failure of caddis hatches to materialize in the evening. Maybe you left without the sounds of songbirds or the cloud of insects trailing behind you. Rest assured that this fight is not over. We can revive the once vibrant display of the Deschutes River that you’ve long known. Thank you for your support over the past four years, and cheers to Year Five: may it be the loudest ever. For months, the DRA has been working to defend citizens’ authority to enforce water quality requirements at hydroelectric projects. This past Monday, August 14, the U.S. Court of Appeals for the Ninth Circuit appeared to put this critical question to rest by siding with the DRA and refusing to hear a PGE appeal on the issue. This decision will allow DRA’s critical Clean Water Act lawsuit to proceed, and is an important victory for clean water advocates across the country. A full recap of the lawsuit to this point can be found here. In short, PGE has sought to persuade the federal district and appellate courts to dismiss the DRA’s lawsuit, arguing that citizen groups like the DRA have no authority under the Clean Water Act to enforce water quality requirements at hydroelectric projects. This spring, Judge Michael Simon, of the District of Oregon federal court, roundly dismissed these arguments, affirming that the Clean Water Act “citizen suit” provision clearly authorizes lawsuits like the DRA’s. PGE then petitioned the U.S. Court of Appeals for the Ninth Circuit to hear an appeal of that ruling. On August 14, after reviewing the parties’ briefing, a Ninth Circuit panel of judges denied PGE’s request for permission to appeal. This decision will leave Judge Simon’s important ruling undisturbed and allow DRA’s lawsuit to move forward. The Ninth Circuit’s decision has great significance for water quality in the lower Deschutes River, and for other rivers across the country that are severely impacted by hydroelectric projects. DRA has been working diligently for many months to protect citizens’ essential enforcement authority, and will continue to do so if necessary. And now, we are eager to present the merits of our case to Judge Simon. DRA’s Clean Water Act lawsuit is a critical part of our efforts to restore clean, cold water and a healthy aquatic ecosystem to the lower Deschutes River. Keep an eye on the DRA blog for more updates as they develop in this important case. For anyone who has fished the lower Deschutes River this year, it is not news that many of the fish being caught have Black Spot Disease (BSD). How many fish? We’ve received reports of as many as 100% of 30 fish caught over a three-day trip between Trout Creek and Harpham Flat. Most reports are that 60 to 80% of landed trout have obvious evidence of BSD. Lower Deschutes River bull trout showing obvious Black Spot Disease. Photo courtesy of Nick Wheeler. We’ve not seen any research reports from ODFW regarding BSD, although it’s not unusual for these reports to not be advertised or be made readily available. What is unusual is that anglers who fish the bodies of water mentioned by ODFW do not report seeing BSD. This is not to say that BSD isn’t present on the John Day and other rivers, but it’s clearly not present right now to the same extent as in the lower Deschutes. According to the statement from ODFW, BSD “is not categorized as a disease.” This is a curious claim. Why is it called Black Spot Disease? In all of the scientific literature that we searched, it is always referred to as a disease. This is because infection with BSD results in both systemic inflammation and tissue changes in fish. Inflammation is evidenced by increased cortisol (a hormone associated with stress and inflammation) levels. The skin and scale changes seen on fish with BSD are not caused by trauma. So we have a transmissible infective organism causing inflammation and tissue changes. That meets the definition of a disease. The fish ODFW representatives have observed with BSD are noted to be in good condition. Yes they are, when they are caught. But no one is performing long-term observation to see what the consequences of chronic infection might be. We are now in the third year of BSD being observed in lower Deschutes River fish, so it’s obvious that more fish are being infected for longer periods of time. None of the studies on BSD to date look at longer-term infections, so those consequences are unknown. What is known is that fish do die of BSD. According to reports, once fish are infected in the eyes or mouth, survival is limited. And fish with high parasite loads tend to be of lower weight. The ventral surface of a redband trout with Black Spot disease, caught in the lower Deschutes River in late April 2017. Photo by Jamey Mitchell. Black spot disease is caused by a flatworm (trematode) parasite known in the scientific community as Uvulifer ambloplitis, and also known as “neascus.” This parasite has a complicated life cycle that starts with eggs in water, which hatch and become juveniles known as miracidia, which in turn infect aquatic snails. In snails this form of the parasite matures into the next life form, known as cercariae. Cercariae are shed by the snails and become free swimmers, which attach to fish. Once the cercariae have attached to the flesh of a fish, the fish develops an immune response that causes the dark spot. Fish-eating birds are the next host, which become infected when they ingest infected fish. The cercariae develop into adult flatworms, which means that fish-eating birds are internally infected with the parasite. The parasite then produces eggs, which are shed in feces by fish-eating birds, and deposited in water where the life cycle is reinitiated. This summer, many have observed decreases in fish-eating birds in the lowest forty miles of the Deschutes. Kingfishers are rarely seen now in that reach of river (they were previously seen in pairs occupying nearly every reach of river), and merganser populations in the lower forty miles have declined. Are these birds becoming infected with neascus and dying? Or is something else going on? Unfortunately, no one seems to be investigating this phenomenon. Increases in BSD are associated with increased water temperature and increased aquatic snail populations—both conditions that Selective Water Withdrawal Tower operations have created in the lower Deschutes River. Further, research has demonstrated that rather than being “cyclic,” BSD is linked to sustained elevated water temperatures and algae growth. The likely solution to reducing BSD is a return to cooler water temperatures and less nutrient loading in the lower Deschutes River. This would require that the SWW tower draw more water from the bottom of Lake Billy Chinook before discharging downstream. Schaaf, Cody J, Suzanne J. Kelson, Sébastien C. Nussle, & Stephanie Carlson . Black spot infection in juvenile steelhead trout increases with stream temperature in northern California. Environmental Biology of Fish,; April, 2017. Schaaf, Cody J. Environmental Factors in Trematode Parasite Dynamics: Water Temperature, Snail Density and Black Spot Disease Parasitism in California Steelhead (Oncorhynchus mykiss). Submitted to University of California Berkley for Masters Thesis, May, 2015. On Friday, August 4, 2017, the Oregon Fish and Wildlife Commission voted to make the bass fishery in the lower Deschutes River a “no bag limit” fishery, beginning January 1, 2018. A smallmouth bass caught last week on the lower Deschutes River. This is a positive step toward dealing with the bass invasion of the past few years. It is also an acknowledgement that we have a problem in the lower Deschutes River. As we’ve noted in previous blogs, bass have been infrequently reported in the lower Deschutes River, in very small numbers, for many years. However, in the past two years the numbers of reported bass have grown significantly, with some anglers this year reporting catches of up to 20 bass per day below Macks Canyon. These omnivorous and voracious predators feed on a mix of food types including juvenile fish (trout, steelhead, Chinook, shiners, etc. ), crawdads, and aquatic insects. As their numbers increase, they pose an increasing threat to the ecology of the lower river. Unlike in other fisheries where bass have been artificially introduced by well intended, but ill-advised, amateur biologists, the bass in the lower Deschutes River appear instead to have moved up from the Columbia River. This has happened because, remarkably, the lower Deschutes River is now warmer in the spring than the Columbia River. This is due to current selective water withdrawal operations at the tower above Round Butte Dam. During springtime, 100% surface water withdrawal is used to attract juvenile fish to the fish collection facility at Round Butte Dam. This surface water is many degrees warmer than water at the bottom of the reservoir, which was the source of water for dam operations prior to 2010. The warmer water in the lower Deschutes River attracts bass and allows them to become more active earlier in the year. This gives them more time to feed before the next winter, and an earlier start on spawning. DRA Board member Steve Pribyl with a smallmouth bass caught last summer. Perhaps the saddest comment on the new bag limit is that most anglers are releasing the bass they catch in the lower Deschutes, in order to have something to catch in the future as this treasured river continues to change so rapidly. However, we would encourage all anglers to remove these fish from the water. Do not dispose of them on the bank, as that is a violation of rules regarding wasting of game fish. The need for this change in fisheries management is another unanticipated and unintended consequence of SWW tower operations. And another sign that it’s time to reconsider how the tower is operated, along with current strategies for reintroducing fish above the Pelton-Round Butte Project. The fish have spoken. And those fish are walleye. Remarkably, there are now walleye in the lower Deschutes River. As far as anyone is aware, this has never happened before. We wish this was good news. But it’s not. We’ve been getting reports of walleye being hooked and landed as far upriver as Kloan, at River Mile 7. We’d not mentioned it yet as we were waiting for documentation of a landed walleye. Now we have it–the walleye in the photo below was landed at River Mile 4.5. Photo provided by Deschutes River guide Brad Staples, pictured on the right. In addition to walleye, smallmouth bass continue to be been taken in good numbers in the lower river this summer, for the second straight year. Trout and steelhead, not so much. What does this mean for the lower river? As the lower river ecology and habitat changes due to Selective Water Withdrawal operations, so do the species that thrive in the new conditions. Warmer water attracts warm water fish. As insect populations decrease, piscivorous fish (fish that feed on other fish) increase. Further, this is not good news for salmon and steelhead juvenile migration. Juvenile steelhead and salmon are preferred food items for walleye and often for bass, much as they are for northern pikeminnow. Bass and walleye are also capable of feeding on crawdads, worms and insects, and generally are known for being highly predatory feeding machines. Looking into the mouth of the walleye. Photo from American Expedition. Clearly, this is no longer the river we knew prior to 2010. But fortunately, we know these problems are not inevitable. A return to cooler, cleaner water discharged from the Pelton Round Butte Project can begin alleviating these discouraging ecological changes in the lower river. It’s time for the responsible agencies, dam operators, and other parties to admit that the Selective Water Withdrawal tower is responsible for some serious unintended consequences, and begin charting a new path forward for lower river management. The Deschutes River Alliance will remain on the front lines of the battle to restore this treasured river. Please join us in our efforts.